Vancouver, British Columbia--(Newsfile Corp. - February 21, 2019) - Great Bear Resources (TSXV: GBR) (the "Company" or "Great Bear"), today reported drill results from the Dixie Hinge Zone ("DHZ") at its 100% owned Dixie Project in the Red Lake District of Ontario. Drill hole DHZ-023 intersected a 42-metre-wide (138 feet - approximate true width) zone of increased hyrdrothermal alteration, sulphide mineralization and multiple quartz veins hosting significant gold mineralization from 121 to 158 metres vertical depth, approximately 50 metres to the west of previously reported Hinge Zone drill holes. Gold-bearing vein intercepts from DHZ-023 include 3.40 metres of 31.60 g/t gold, which includes 1.75 metres of 61.05 g/t gold, and 2.80 metres of 9.91 g/t gold, which includes 1.50 metres of 17.88 g/t gold. A summary of drill results is provided in Table 1. Hole DHZ-017 was drilled as a significant 50 metres down-plunge step-out from the deepest previous Hinge Zone drilling. It intersected 1.50 metres of 28.01 g/t gold including 0.50 metres of 80.44 g/t gold. This hole extends the down-plunge depth of the Hinge Zone to 281 metres. All (100%) of the 38 drill holes completed by Great Bear along 330 metres of strike length of the Hinge Zone that has been drilled to date have intersected gold mineralization. 22 of 38 drill holes (58%) have intersected intervals containing greater than 10 g/t gold. Chris Taylor, President and CEO of Great Bear said, "We continue to be surprised by the strength and scale of the gold system at Dixie. Our latest drilling shows the Hinge Zone vein and alteration system swells to 138 feet (42 metres) in approximate true width, includes individual veins over 45 feet (14 metres) in width, and contains multiple gold-bearing veins in 4 of the latest 8 drill holes. We will continue to drill to extend the strike length, depth, and number of gold zones at the Dixie Hinge through 2019 and 2020. In addition, a second drill rig is now operational and will test a number of new targets across the property that the Company feels have strong potential to host new gold discoveries." Table 1: Most recent results from Hinge Zone drilling. Multiple gold veins were intercepted in 4 of 8 drill holes. * width is determined to be 90-95% of true width based on intersection points of the drill hole intercept with the geological model and oriented drill core data. An additional drill hole, DHZ-019 was drilled off plunge of the primary mineralization to test for additional parallel zones and intersected a massive basalt unit with anomalous gold values of up to 0.28 g/t gold. The new discovery of the thickened near surface vein zone demonstrates the "South Limb" and Hinge Zones form one continuous vein set. The Hinge Zone name will be retained going forward. Apparently continuous, gold-bearing quartz veins swell and narrow, as well as merge and divide along the 330 metres strike length of the Hinge Zone vein system drilled to date. An updated cross section of the Hinge and Dixie Limb Zone is provided in Figure 1. An updated long section through the Hinge Zone is provided in Figure 2. An image of core boxes from the vein zone is shown in Figure 3. Figure 1: Cross section of Hinge Zone (left) and Dixie Limb Zone (right) showing drill results to-date. New results highlighted in yellow. Great Bear is currently undertaking a fully-funded 30,000 metre, approximately 150 drill hole program that is expected to continue through 2019 and 2020. A second drill rig was added to the project in early February 2019 to accelerate this work and is now drilling additional gold targets. The Company also reports it has granted an aggregate of 500,000 stock options to employees, directors, consultants and advisors of the Company, exercisable at $3.72 per share for a period of five years. The options are subject to a four month hold period. 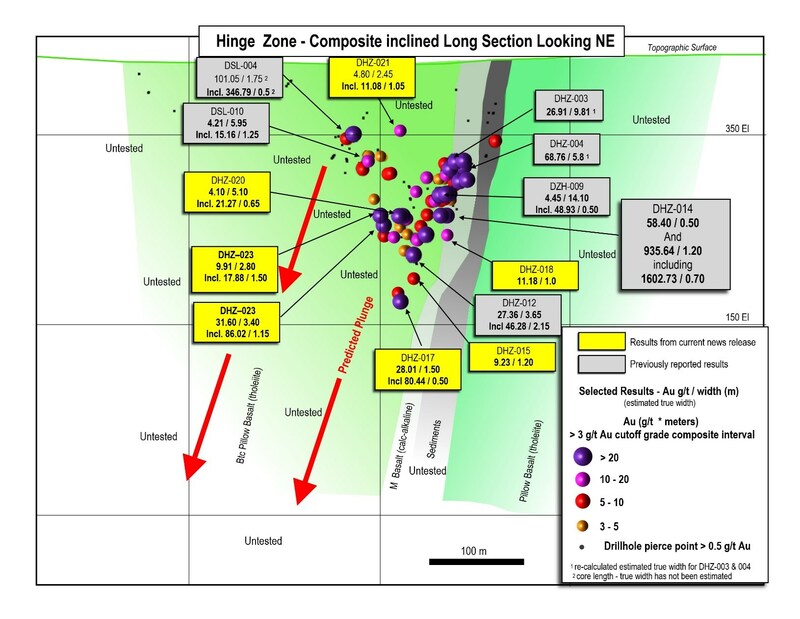 Figure 2: Long section through the DHZ as drilled to-date showing currently reported drill results. New results highlighted in yellow. Figure 3: Image of the total vein zone in DHZ-023. Down-hole metre marker blocks are shown overlain on the core boxes. The Dixie property is located approximately 15 minutes' drive along Highway 105 from downtown Red Lake, Ontario. The Red Lake mining district has produced over 30,000,000 ounces of gold and is one of the premier mining districts in Canada, benefitting from major active mining operations including the Red Lake Gold Mine of Goldcorp Inc., plus modern infrastructure and a skilled workforce. The Dixie property covers a drill and geophysically defined 10-kilometre gold mineralized structure similar to that hosting other producing gold mines in the district. In addition, Great Bear is also earning a 100% royalty-free interest in its West Madsen properties which total 3,860 hectares and are contiguous with Pure Gold Mining Inc.'s Madsen property. All of Great Bear's Red Lake projects are accessible year-round through existing roads. 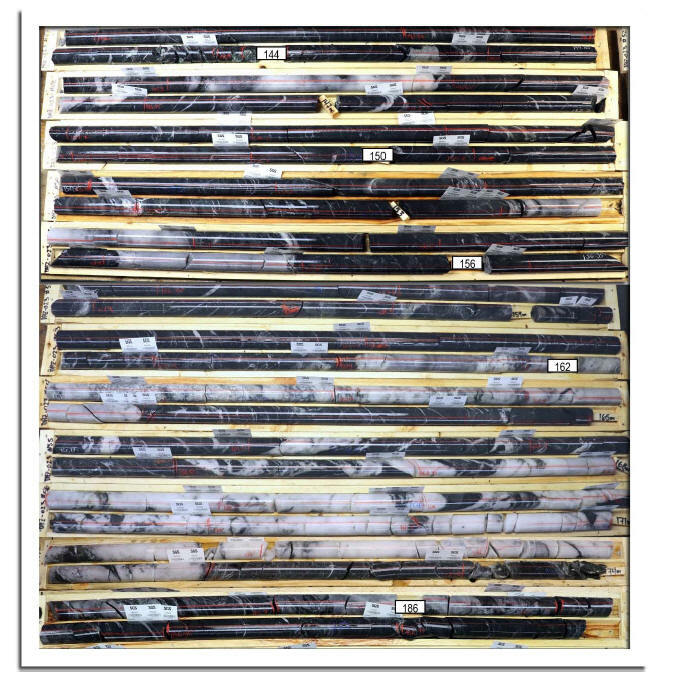 Drill core is logged and sampled in a secure core storage facility located in Red Lake Ontario. Core samples from the program are cut in half, using a diamond cutting saw, and are sent to SGS Canada Inc. in Red Lake, Ontario, and Activation Laboratories in Ancaster Ontario, both of which are accredited mineral analysis laboratories, for analysis. All samples are analyzed for gold using standard Fire Assay-AA techniques. Samples returning over 3.0 g/t gold are analyzed utilizing standard Fire Assay-Gravimetric methods. Selected samples with visible gold are also analyzed with a standard 1kg metallic screen fire assay. Certified gold reference standards, blanks and field duplicates are routinely inserted into the sample stream, as part of Great Bear's quality control/quality assurance program (QAQC). No QAQC issues were noted with the results reported herein.